Thirteen-year-old Ghalib wishes his life could go back to normal. He wishes he could still hang out at the market with his friends, root for his favorite soccer team, even go to school. But civil war has destroyed his home. As violence rages around them, his family makes the difficult choice to flee Syria. Together they start out on a dangerous journey toward Europe. Along the way, they encounter closely guarded borders, hardscrabble refugee camps, and an ocean crossing that they may not survive. 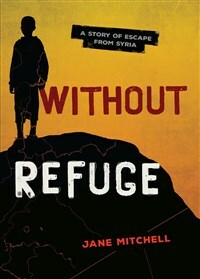 The gripping story of one boy's journey to find refuge pays tribute to struggles millions of Syrians face in today's real-world crisis. Jane Mitchell is an award-winning author of books for children and young people. Her novel Chalkline was endorsed by Amnesty International Ireland for contributing to a better understanding of human rights. She lives in Ireland.